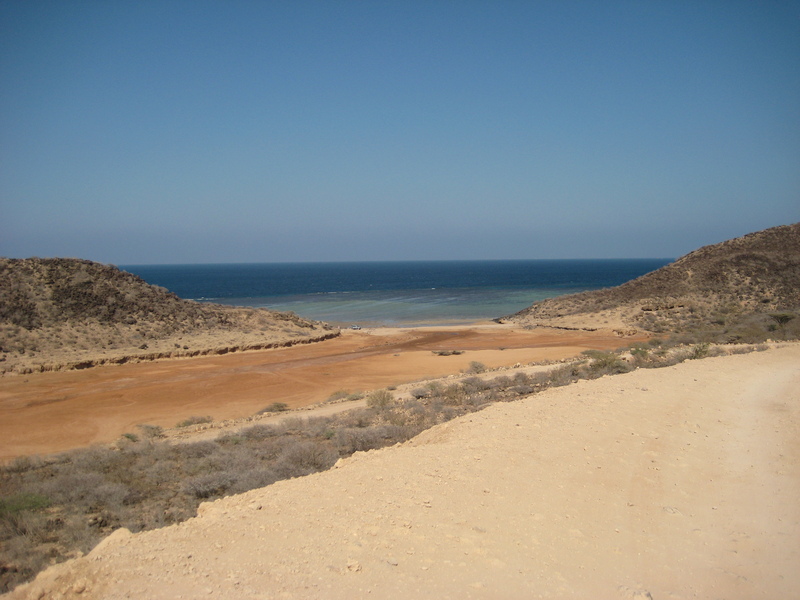 Khor Ambado Beach, Djibouti - popular with French families, a bumpy ride away from Djibouti ville - make sure you have a 4x4 vehicle to get here!! Being in a city right on the coast has its advantages. 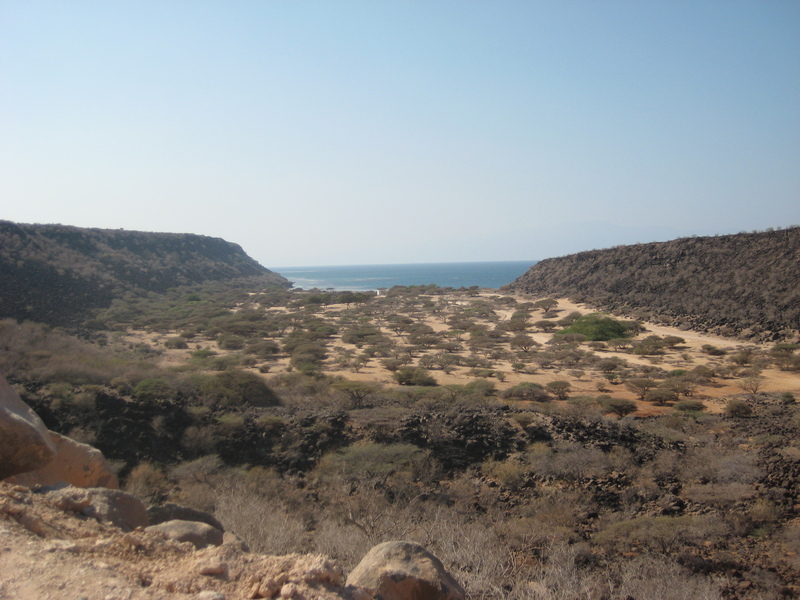 There are beautiful beaches here in Djibouti, but beach-going has its own interesting aspects. 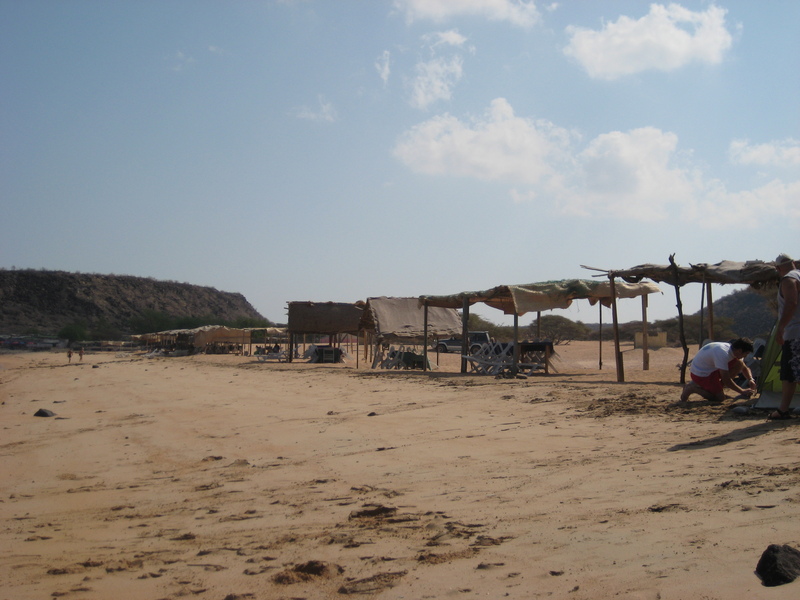 For one thing, there is a beach road in Djibouti-ville that the locals use, but I certainly wouldn’t – the Muslim culture comes too much into play there, and it seem to be used exclusively by men & boys. I have yet to see a single woman there enjoying the beach when I drive past, though I have driven past and seen a naked little boy running across the street away from the beach! Plus, that particular beach has a few major downsides. Not far down the street is the sewage treatment plant, and even an open sewer drain. It makes for unpleasant smells to drive past, so I would prefer not to swim anywhere near there, myself. Some of the local hotels have their own private beaches, and these are nice, and have the advantage of being frequented by foreigners so women are welcome, and can wear bikinis without attracting any unwanted attention. I personally still favor tankinis, in recognition of the Muslim sensibilities around here – but while I’m sensitive, I won’t go so far as to invest in a burkini – see http://www.burkini.com/ (thanks are due to MP-D, who first alerted me to the existence of the Burkini – I haven’t seen them in Djibouti, but I know they are used in Jordan!) The issue even at the private beaches, however, is that sometimes the whole region can take on a certain odor – kind of a rotten egg smell. 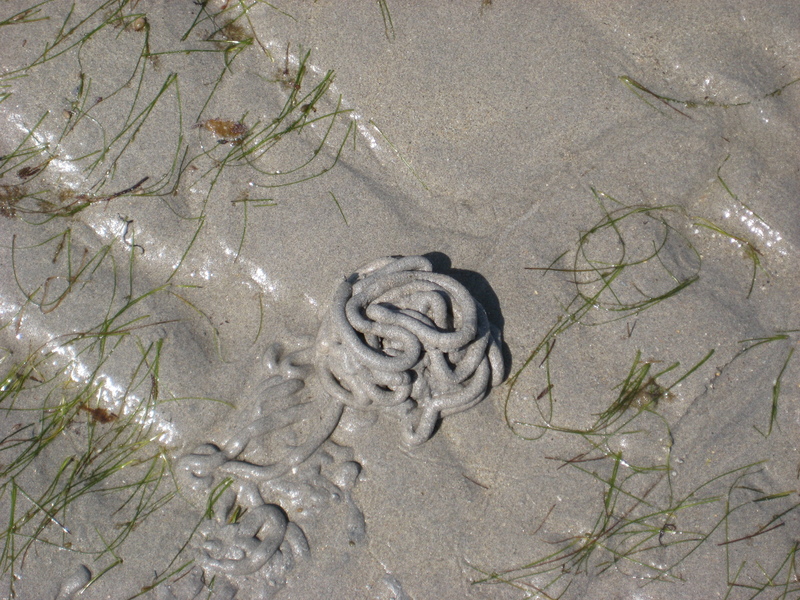 I’m not sure where it’s coming from exactly – maybe there are a lot of sulfur deposits that are exposed to air when the tide goes out or something – but it is very distinct and can be overpowering at times. That certainly takes some getting used to!! And it makes it worth your while to hop in a car (4 wheel drive definitely recommended, if not downright required!) and drive a little out-of-town to go to the beaches. 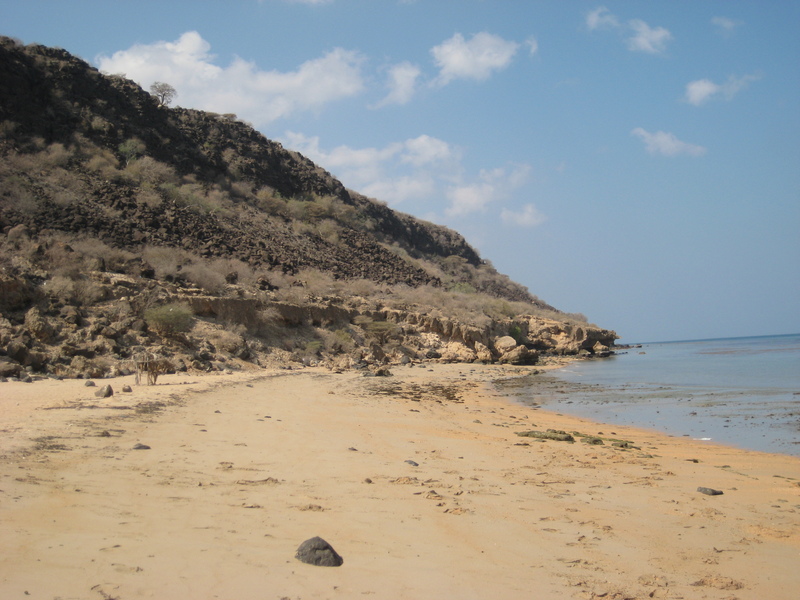 One of the closer, nice beaches to Djibouti-ville is Khor Ambado, just past the French military base. You have to know where to veer off of the paved road to find the path to that beach, and it is a pretty bumpy ride, but it is well worth it. You will pass a man with a shovel along the route, and it is customary to give him a tip. He is there to keep the path clear of boulders or rocks. And the dirt road is lined by these stacks of precisely balanced rocks, appearing to almost defy gravity. There he stands, by the road, waving for you to stop and give him a tip – a few coins or a bottle of drinking water are acceptable tips. You drive over a hill-y area, and then down to the beach. The beach is lined with covered tables, as there are some little restaurants set up there, and you can order food. My understanding is that you are supposed to call ahead and let them know if you will be eating or not, but I’m not sure about that, as I was a tag-along on my trip out there, not the organizer. You are welcome to use the tables (and shade) even if you don’t eat, but you are still expected to leave a tip of about 500 Djiboutian Franc per person (which comes out to about $3 U.S. or so) per person. The advantage of Khor Ambado is that the covered tables make it really easy to set up there with a group. It’s a great place for families because there is a lot for kids and adults alike to explore. 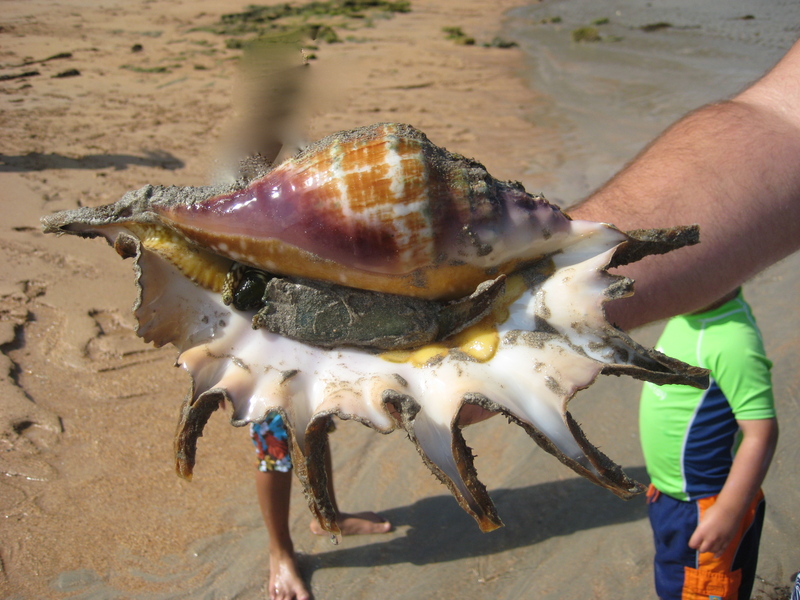 There are many crabs, digging holes in the sand, and occupying beautiful shells that are scattered around the beach. 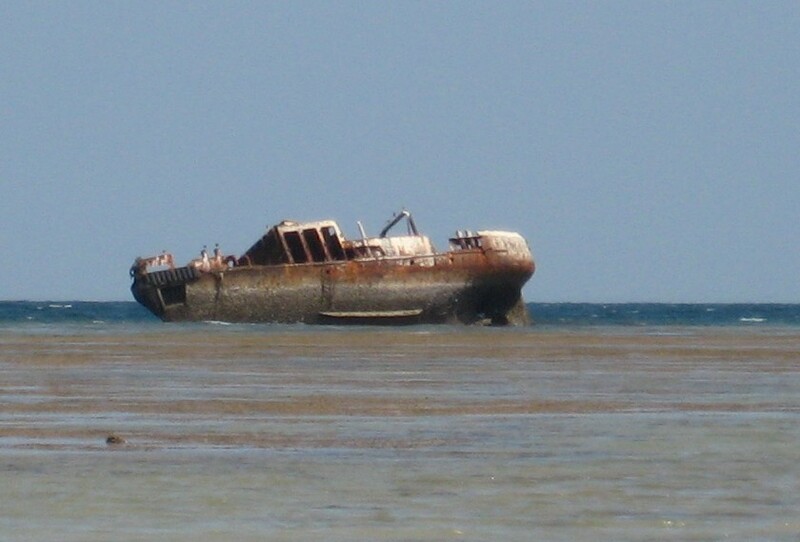 There is also a shipwreck not far off of the beach that during low tide, you can pretty much walk right up to. It’s pretty amazing how far out the tide goes, and you can usually walk pretty far out in shallow water, making it great for young kids and for the parents who are trying to keep an eye on them! The shaded tables are comfortable, and make packing for the trip an easier chore, as there is no need to bring your own chairs unless you want to lounge in the sun. All in all, a great place for groups and families! Khor Ambado from the road above..... and when I say road, I dont mean anything paved! Its basically a bumpy path. Strange sand pile, I think made by a crab digging a hole. They were popping up all over! Thank you for mentioning MarSea Modest Swimwear http://www.marseamodest.com. I am wondering how your friend got the link. Please visit our website and contact us for further information. I am not sure. But I can ask her to contact you and let you know! You’ve really been to some off-the-beaten path places. That’s my kind of traveling, too. Cheers! 🙂 I have!! I like checking out places that many people will never get to see & my job allows me to do just that! I feel very lucky! !